Laura Shaffer to open for Bob Newhart at Reynolds Hall, Smith Center Grammy- and Emmy-winning Comedy and Television legend has tapped Laura Shaffer to open for his Saturday, November 19th show at the prestigious Smith Center for the Performing Arts. The breathtaking and acoustically perfect Reynolds Hall will host the show. The 2,050 seat theater complete with balconies and private boxes will no doubt be a well-matched venue for both Bob's multi-generational legions of fans, as well as the musical performance of Ms. Shaffer and the orchestra, led by Mark Barrett. Tickets range from $39-$99, show time is 7:30pm. On August, 6th, Caesar's Palace in Las Vegas will culminate a month of festivities with an invitation-only show headlined by Tony Bennett. 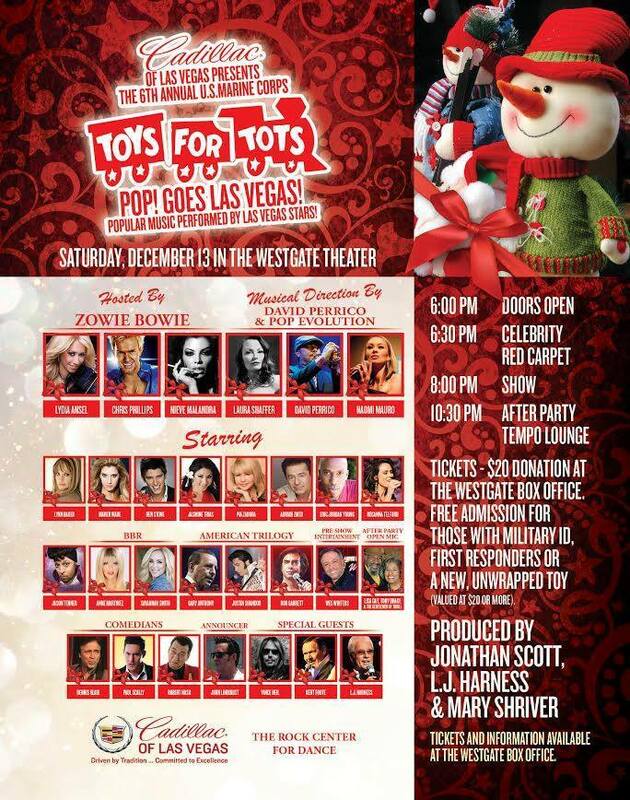 Laura Shaffer will be among the performers appearing alongside Mr. Bennett, as well as legends Donny and Marie, J. Lo, and The Righteous Brothers. The 20 piece orchestra will be conducted by the venerable Trumpeter/Bandleader, Lon Bronson. Laura's 2015 vintage pin-up and Golden Era Almanac has been released for sale to the public. Available now on Amazon and eBay. A collaboration with Laura's photographer, Darryl Martin, the calendar not only has 12 months of vintage pin-up tribute for fans, but every month also has dozens of dates of important or interesting events in cinema, music, culture and politics of the Golden Era. A must for Laura Shaffer fans, as well as fans of pin-up and vintage lifestyle. You can also find a link here on the "Shop" tab. 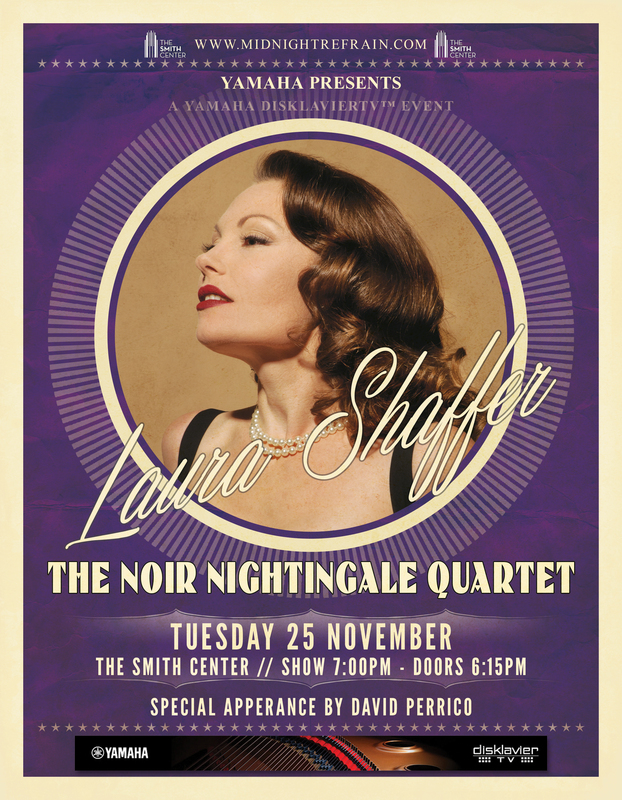 On Tuesday, November 11th, Laura Shaffer will appear with her trio in Cabaret Jazz at The Smith Center. Presented by Yamaha, as part of their Yamaha DisklavierTV™ Events series, music fans around the world will be able to subscribe, and Yamaha Disklavier piano owners will also be able to watch their piano being played remotely in their home in sync with the band. There will be a select number of seats for live audience as well, but they must be reserved in advance. Show is at 7:00pm. Teaser trailer for Laura Shaffer segment on CNN's Emmy-winning Anthony Bourdain: Parts Unknown, airing this Sunday, April 20th! CNN has announced the date that will begin the 3rd season of it's Emmy-winning travel show, Anthony Bourdain: Parts Unknown, which will feature chanteuse Laura Shaffer in it's Las Vegas episode. Look for the premiere show of the season on April 13th, at 9:00pm Eastern. The Las Vegas episode will air sometime in the first few weeks of the weekly schedule. Laura Shaffer and Chandler Judkins' Groovin' High Orchestra join with charities Second Wind Dreams and Alzheimer's Foundation of America to help 90-year-old Doris Groper's dream come true of reliving her jitterbug days. The two national charities teamed up for the AFA-SWD Sleeping Dreamers Project, which fulfills dreams of individuals who have Alzheimer's or related illnesses. Groper was one of those individuals. Her wish was to dance the jitterbug again. That dream came true when the Chandler Judkins' Groovin' High Orchestra featuring Laura Shaffer performed in her honor at the Las Ventanas Active Adult Living Community. The Caesars Foundation supports Las Ventanas' membership to Second Wind Dreams. Noted jazz singer Laura Shaffer travels to Dallas, Texas as the featured entertainment at the launch of former Dallas Cowboy quarterback Drew Bledsoe's latest vintage of "Doubleback". The private event is to introduce former NFL Pro Bowl quarterback Drew Bledsoe's wine label to the upscale Dallas, TX market. The celebrated "Doubleback" wine will be offered at this exclusive, invitation-only tasting, held on April 22nd. Drew Bledsoe was a premiere quarterback in the NFL with the New England Patriots, Buffalo Bills, and Dallas Cowboys before retiring a few years ago. His McQueen vineyards are located in Walla Walla, Washington, where he is from. More information can be found at Doubleback.com. Silver Screen Magazine, a Hollywood fan magazine first issued in 1930 and for decades an iconic entertainment magazine featuring such cover girls as Carole Lombard, Betty Grable, Ava Gardner, and Marilyn Monroe, returns in hard copy format with a special issue entitled "The Classic Glamour is Back!” The reemergence of the print edition is scheduled for August 2010 and features Jazz Artist Laura Shaffer as the cover girl. Silver Screen Magazine is also issuing retro editions of the magazine from its glory years as a leading entertainment magazine for many decades. The first retro issue can be seen in the HBO mini-series Mildred Pierce, featuring Kate Winslet reprising the title character role that won Joan Crawford an Academy Award in 1945. 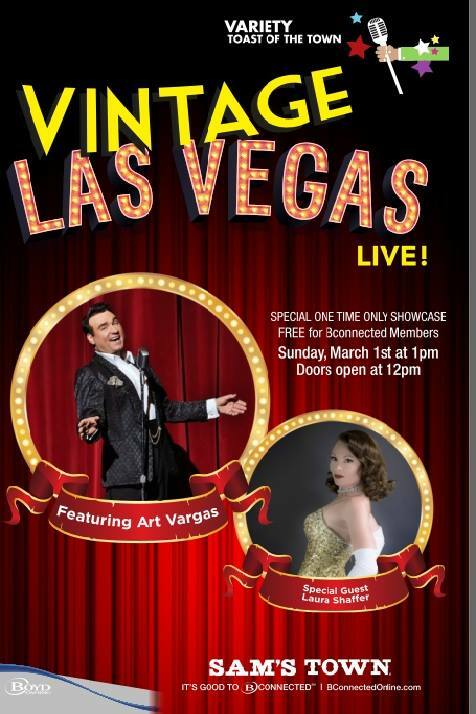 Laura Shaffer, a Las Vegas-based performer, specializes in recreating and promoting the glamorous style, music, and fashion of the 1930s, 1940s, and 1950s. 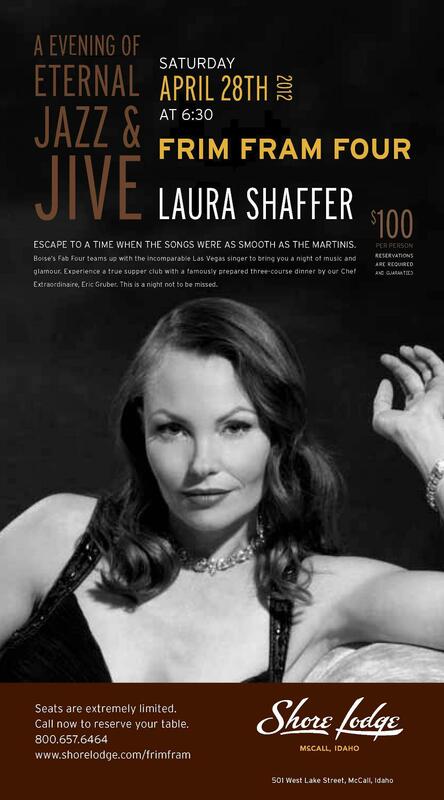 The timing of the August edition of the Silver Screen Magazine edition will coincide with the release by RKO/Unique Records of the Laura Shaffer performance of her newest CD, entitled "The Julie London Songbook". In this album, Miss Shaffer captures the great songs made famous by the popular torch singer Julie London back in the 1950's. Midnight Refrain has opened a boutique shop within the Classic Hollywood Gems store located in the historic Boulder Dam Hotel in Boulder City, Nevada. Boulder City is the headquarters of Laura Shaffer's Midnight Refrain. The Midnight Refrain Boutique Shop offers items seen in the E Commerce Store of Midnight Refrain.com. Logo wear, collector postcards, CDs and eventually DVDs will be offered there by Midnight Refrain. The Classic Hollywood Gems shop offers a wide collection of top quality jewelry reproductions, as worn by famous actors and actresses in classic Hollywood movies. Each piece of jewelry comes with an information card telling of the star who owned it and in what movie. Ms. Shaffer explained, "I get so much love and support from the people of Boulder City that being able to do this there just delights me." 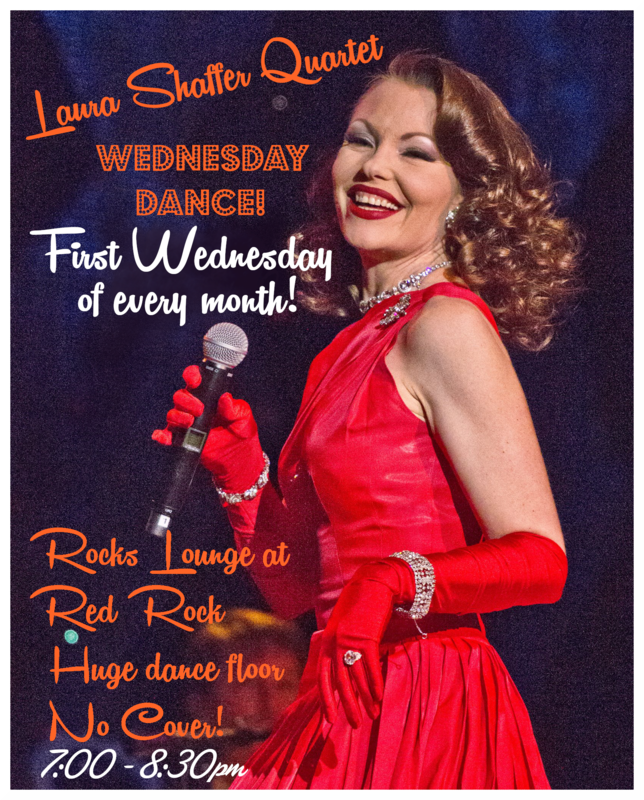 Jazz artist Laura Shaffer will perform the songs from her new RKO Records CD 'The Julie London Songbook" for a TV and DVD Special. 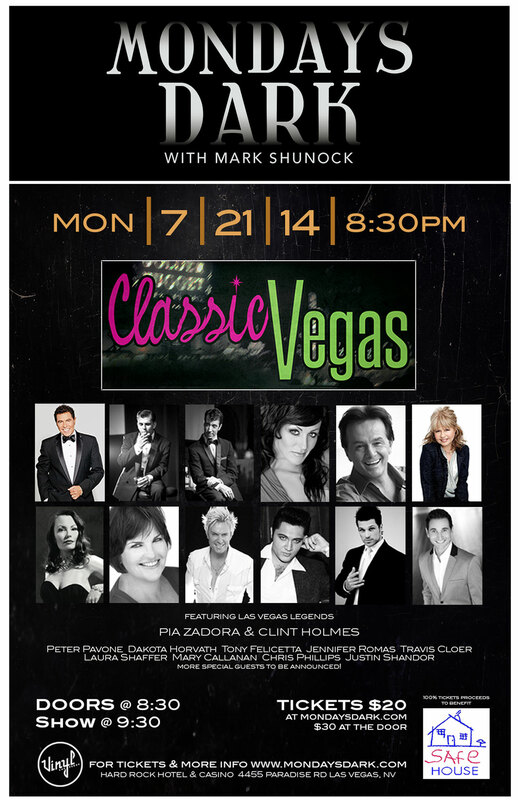 The Monday night July 18th show will begin at 7:30pm. 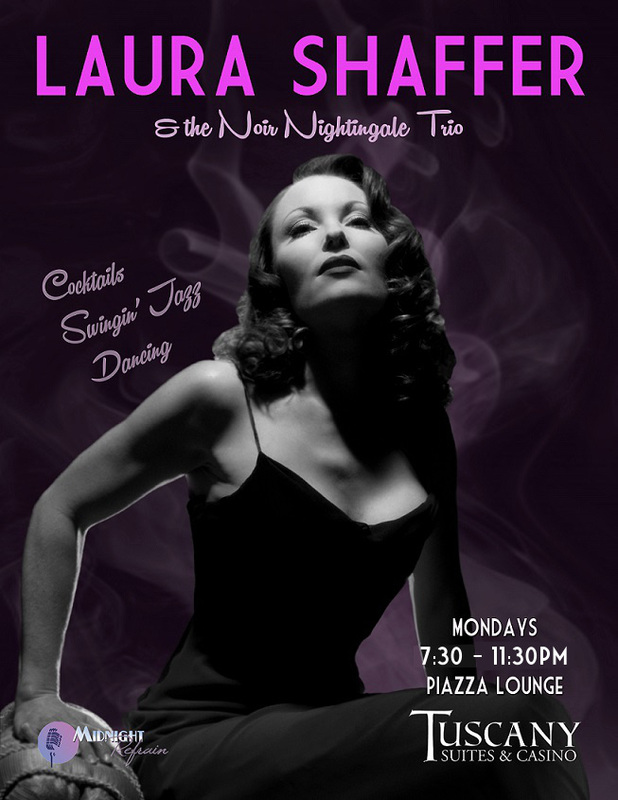 Laura Shaffer appears regularly in the Las Vegas area with her combo at both public venues and private corporate events. 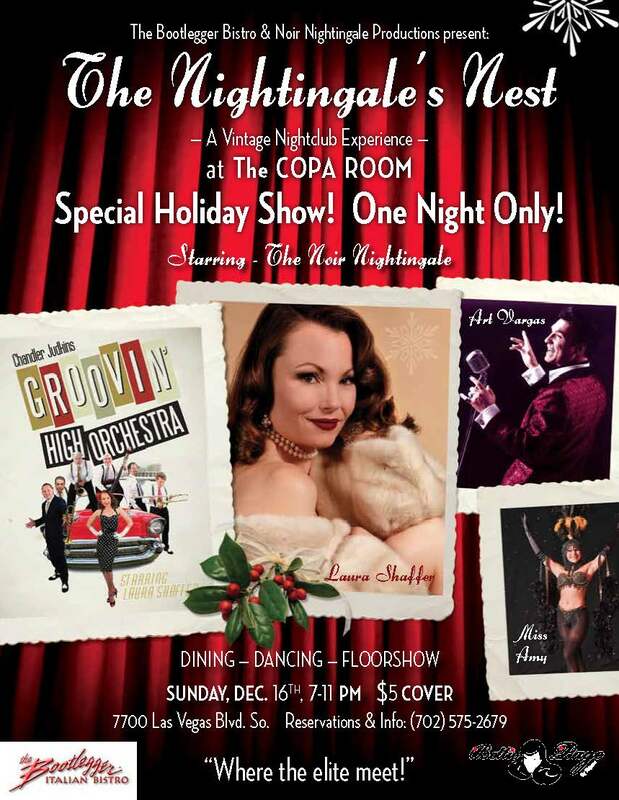 She also is the featured singer with the Bruce Harper Big Band, New Jazz Testament, Chandler Judkins’ Groovin’ High Orchestra, and the on-stage partner of legendary showman Art Vargas. RKO Records is a top jazz record label, and has been releasing jazz stalwarts such as Duke Ellington, Count Basie, Miles Davis, John Coltrane, Muggsy Spanier, Herbie Fields, Laurindo Almeida, Dave Pell, Hubert Laws, Lester Young, Rudy Vallee, and Ted Lewis since the 1950's. "RKO Records rarely releases a debut jazz album, but Laura Shaffer's fabulous talent and beauty has compelled us to make this exception," said RKO Records Chairman Tom Ficara. 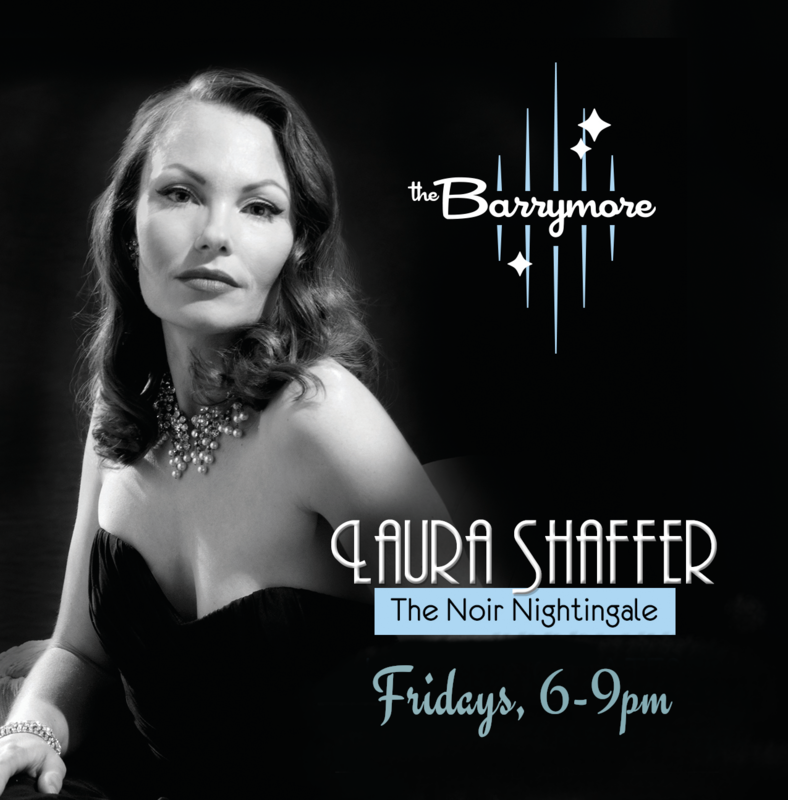 "’The Julie London Songbook’ is not a tribute album but rather a fabulous artist we think of as the 'Noir Nightingale' giving her own renditions of these great songs."